Hildur Ásgeirsdóttir Jónsson creates woven color field-like paintings. 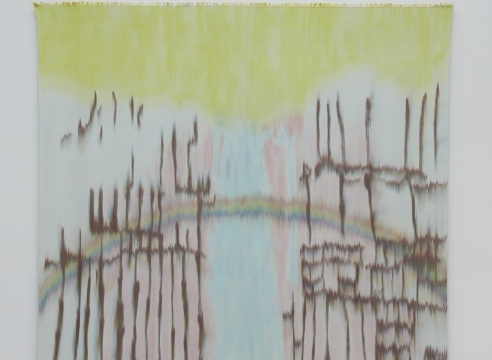 Jónsson weaves hand-dyed, hand-loomed silk textiles, both small and very large in scale. In her first exhibition with the gallery, the show will include a group of small new works as well as one large piece. Her source material comes from the photographs she takes twice a year when she returns to her native Iceland. Cropping and enlarging details of these photographs of mountainous silhouettes and glacial crevasses, she transfers these extracted images and then weaves them into her paintings. She stains the fibers of her warp (the vertical threads), then, once it is dry, weaves in the weft (the transverse threads). This interlacing must be carefully planned, yet the compositions seem impromptu in their finished appearance. Hildur Ásgeirsdóttir Jónsson was born in Reykjavík, Iceland in 1963. She studied architecture at Kent State University and then studied at the Cleveland Institute of Art. She completed a BFA at Kent State in 1991 and received an MFA in 1995. She has had solo exhibitions at the TANG Museum, Reykjavik Art Museum, MOCA Cleveland, Pocket Utopia, NY, and Turpentine Gallery, Reykjavík. Her work is in the collection of The Cleveland Museum of Art and The Reykjavík Museum of Art.